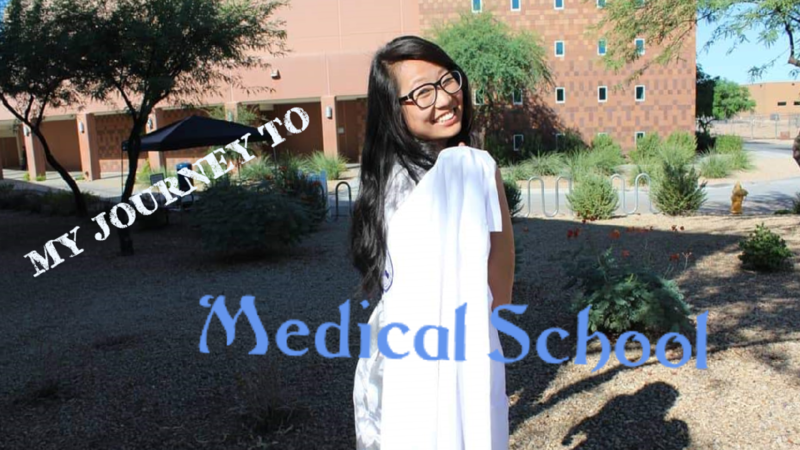 So I recently revealed in my Youtube video my journey to medical school (link here), but I also wanted to have a more specified story about my successful cycle for AZCOM and so that I can have it in writing on this blog. The plus side is the writing doesn’t have my awkward pauses. In terms of the specific details of my acceptance cycle. I applied through AMCAS and AACOMAS in June 2017 and religiously checked my email throughout July so I could write my secondary essays with quick turn around. I kind of decided on DO school over MD school so I put more emphasis on that application. By the time August rolled around I had gotten an email from AZCOM saying that I had been wait-listed before the interview and that they would get back to me. I already felt the dread of my past couple of cycles since I had previously gotten quite a few of these “silent rejections.” I awaited more emails regularly and just waited for what felt like forever. In November I decided to take matters into my own hands and I looked up local open houses for my local medical schools. It just so happened that AZCOM had theirs the next morning so I drove the 2 and a half hours and went to the school. I was lucky enough to hear the Dean talk about admissions and statistics presentation in the morning and I decided to go up to her and ask her about my application. She wasn’t going to talk about it at that moment but I had gotten her business card and that was enough. I called the number on the business card the following Monday since the open house was on a Saturday and made an appointment to see her. Apparently she had a very busy schedule so I had to wait until December to meet her. When December rolled around I made the long drive again to visit her office and we had a discussion. After that meeting she opened the portal for me to pick an interview date. I was so excited! That was the first interview I knew I had gotten. I checked my email the next day and found I had gotten another interview invitation at Marian. In the following month I got more interview invitations at a few more places and went to most of them. I didn’t take any chances with my interview skills and I used a consulting company to advise me on how to answer questions and practice with mock interviews. I know I am a naturally good speaker, but when I get nervous I definitely tense up. My interviews went well and I really don’t remember many of the questions because they were probably the generic ones. Also it is common courtesy to write thank you notes, so I definitely followed up by writing some emails to my interviewers. Definitely do it even though it might not improve your chances. I think it’s just polite and professional. I got into one of the schools in the middle of the cycle in March and I was ecstatic, but in the back of my mind I wanted to follow up with the Dean of AZCOM. After that interview I had gotten wait-listed again so I decided to send a letter of intent. It was late May and my interview buddy who is now one of my closest friends in medical school told me he got in. My heart dropped. I didn’t get the same email he did but after checking SDN and hearing that some people just checked their portals and it changed from applicant to accepted status I just had to know. I’m so glad I checked because low and behold; I GOT IN! So upon getting in you need to do quite a few things before matriculation and I made a YouTube video about the 7 things I did before starting school (link here). Be kind… I was very camera shy originally. Thanks for reading, I hope you enjoyed it and got something out of it. There is still hope for those who are wait-listed or alternate listed. I think you just have to play it smart and make the connections where you can. Let me know if you want more of my stories. I also have interview experiences posted on the blog and you can check those out too. Good Luck!